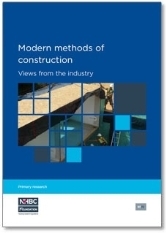 This research aimed to establish current attitudes to modern methods of construction (MMC). The study gathered views from over 160 senior representatives from house builders and housing associations in England and Scotland. A significant finding was that the majority (98%) of the organisations who took part in the study had used or considered the use of an MMC approach on at least one of their developments in the last three years. This suggests a good level of innovation within the house-building sector. A number of benefits were recognised for modern methods of construction, with over 75% of participating house builders pointing to faster build programme and over 50% associating MMC with improved build quality. The report highlights the high level of adoption of factory-made assemblies and components, but a lower level of use of pods and volumetric systems. Historical perspective and cyclical engagement with off-site manufacture, prefabrication and non-traditional construction since the Second World War. Introduces modern methods of construction (MMC) a generic term used more recently to embrace non-traditional and off-site approaches to construction of new homes. The study, which was concluded in late 2015, included qualitative work with focus groups and a quantitative (telephone) survey. It engaged technical directors, technical managers, construction directors, construction managers from house building firms, and development directors and managers from housing associations. Panelised systems (including open and closed panel timber frame systems, open and closed panel steel frame panels, structural insulated panels (SIPS), cross-laminated timber (CLT)). Sub-assemblies and components (including door sets, timber I-beams, prefabricated chimneys, prefabricated dormers, floor cassettes, roof cassettes). Site-based MMC (including thin-joint masonry and insulated structural formwork (ICF)). The report shows the levels of engagement with these approaches among the participating house builders and housing associations. For volumetric systems and pods, which were only rarely used by participants, the report sets out the experiences, insights and perceived risks that may be hindering wider uptake: these included concerns over capital costs, supply chain capacity and how to overcome the constraints of standardisation. The study shows that many house builders and housing associations have a positive view of the future role of modern methods of construction. Over 45% of those taking part believed it will have a greater role in house building over the next three years. Only 3% thought its use would decline.